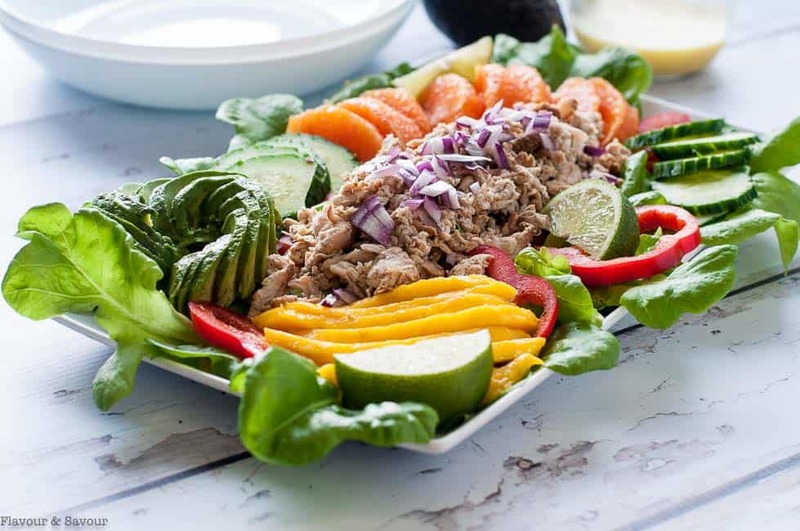 Caribbean Shredded Jerk Chicken Salad with Mango, Oranges, Avocado and Citrus Vinaigrette. Perfectly balanced flavours in a healthy tropical salad. Paleo. 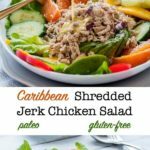 Up your dinner salad game with this Caribbean Shredded Jerk Chicken Salad! Remember those Caribbean Jerk Chicken Breasts I told you about? Next time you make them, make extra just so you can make this Jerk Chicken Salad. Denis and I agreed this chicken is even better in a salad than it is on its own! Why? Perfectly balanced flavours. Spicy chicken, sweet fruit, crunchy veggies and creamy avocado, all in one healthy dinner salad. I bought a new cookbook last week called Salt Fat Acid Heat: Mastering the Elements of Good Cooking. It outlines how important it is to include and balance those four elements in every dish you make. 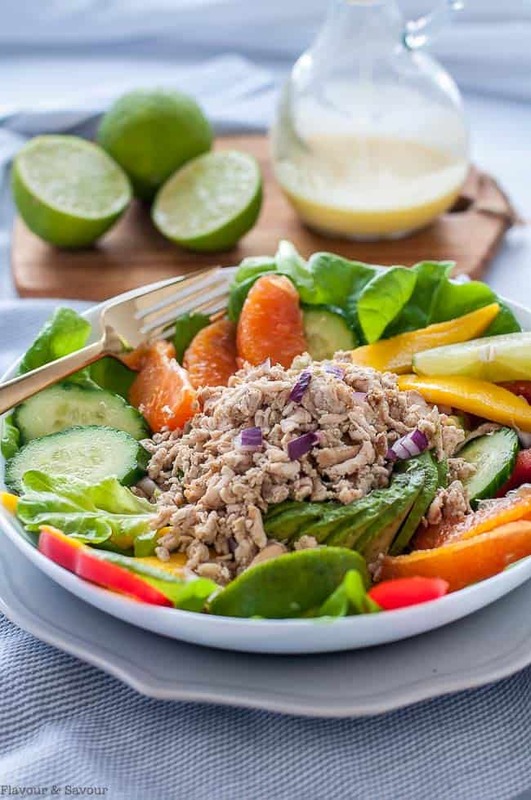 In this Shredded Jerk Chicken Salad, the jerk seasoning provides the salt and the heat, the avocado gives us healthy fat, and the oranges, lime and citrus vinaigrette give this salad necessary acid. 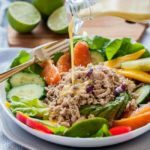 While it’s great to analyze this recipe, we simply loved the contrast of flavour, texture and colour in this salad. Dinner salads are a “thing” in our home. and the Italian influences in this Balsamic Glazed Chicken Salad with Fresh Figs. This recipe is designed to use leftover chicken from these Caribbean Jerk Chicken Breasts. Make it in an instant pot, or bake it in the oven and save some to shred and use to make this lunch or dinner salad. Arrange in a bowl with fresh greens, tropical fruit and avocado and drizzle with a simple Citrus Vinaigrette. 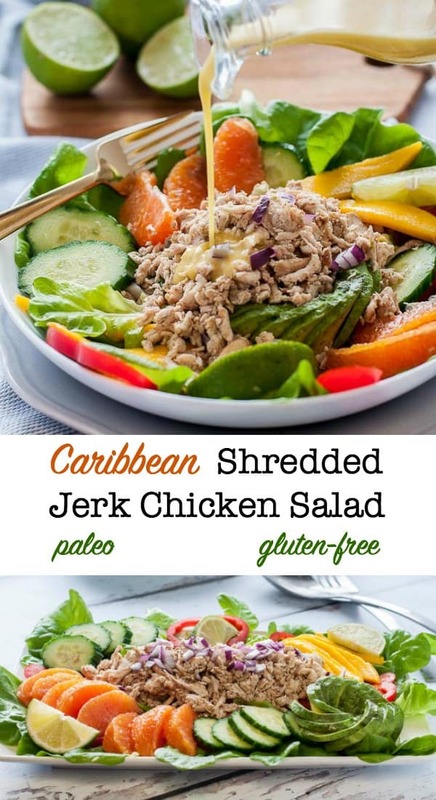 This low-carb, gluten-free jerk chicken salad totally satisfies. You can easily adjust the heat in this recipe by reducing the amount of jerk seasoning you use. Substitute your favourite tropical fruit, like pineapple, papaya, kiwi, or star fruit. 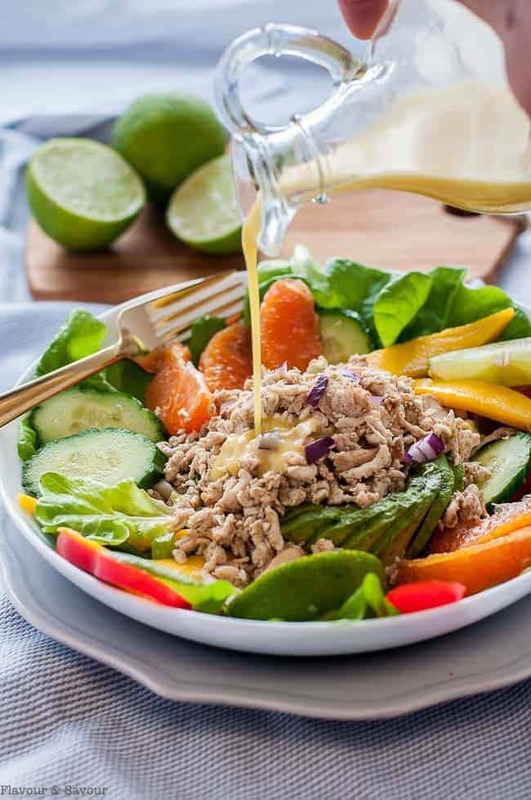 Caribbean Shredded Jerk Chicken Salad with Mango, Oranges, Avocado and Citrus Vinaigrette. 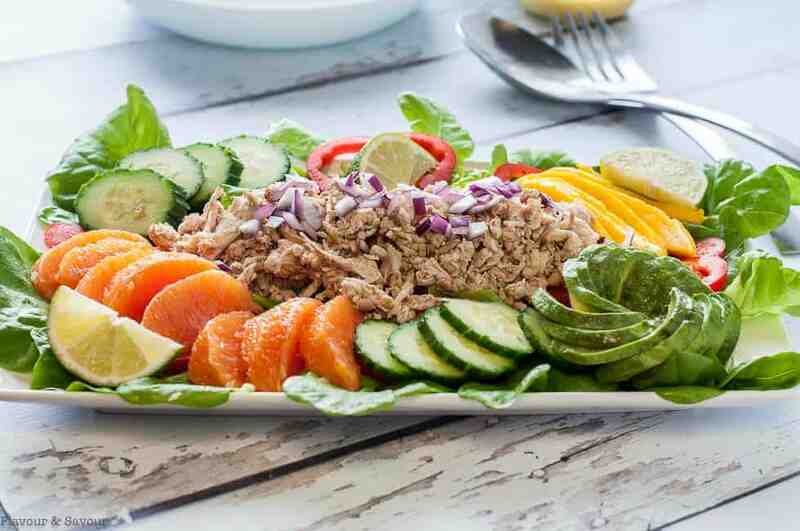 Perfectly balanced flavours in a healthy tropical salad. Whisk Citrus Vinaigrette ingredients together and set aside to allow flavours to blend. 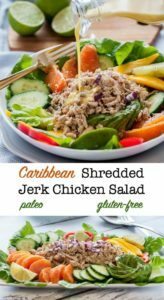 Shred Caribbean Jerk Chicken Breast with two forks or with an electric mixer. Arrange salad ingredients in bowls or on a large serving platter. Top with shredded chicken. Toss or serve with dressing on the side. I love salads for dinner, too, and this one looks amazing! Prepping once to eat twice is such an efficient concept! I have Salt Fat Acid Heat on my radar, so perhaps I should just go ahead and order it. Thanks Cathy! It’s a great book with a interesting concept that make sense. Nice illustrations, too! This is the perfect summer salad Elaine! Love all the colour and flavor! I’m a big fan of chicken salads so I’m definitely saving this one to make later! It’s our favourite way to eat–a big bowl of salad and some lean protein! This salad is gorgeous, Elaine! I love love love big and hearty salads that eat like meals, but I’ve never come across any with this flavor profile. I’m going to have to recreate a pescetarian version of this! So inspired now. Thanks Dana! Try it with shrimp. It’s to die for! Dinner inspo right there Lady! Imma have to make this STAT! Love all the colors! Dinner salads are definitely a thing in my house too, and this sounds amazing! Look at all those colours and flavours, I can taste it!